Palo Alto Networks' breathtaking growth looks set to continue. Palo Alto Networks (NYSE:PANW) is potentially one of the best cybersecurity bets you can make in 2019. The cybersecurity specialist has gone from strength to strength in recent quarters, rapidly adding new customers and extracting more business out of them. It is busy expanding itself into the most lucrative niches of the cybersecurity industry through acquisitions, gobbling up five companies in the past two years. Palo Alto aims to become the ultimate provider of cybersecurity solutions, and the company's latest results indicate that it is well on course to achieve that dream. Palo Alto finished the second quarter of fiscal 2019 with just over 59,000 customers, a jump of around 23% from the year-ago period's customer base. But its quarterly revenue increased at a much faster pace of 30%, to $711 million. In fact, the lifetime value of Palo Alto's top 25 customers increased during the second quarter. The lifetime value of a customer represents the revenue a particular client is expected to generate over the lifetime of the contract after deducting expenses related to client acquisition and servicing. An increase in customer lifetime value generally leads to improved profitability as selling products to existing customers is considered to be far cheaper than acquiring new customers. So it wasn't surprising to see Palo Alto's adjusted net income go up from $98.7 million, or $1.05 per share, in the prior-year period to $147 million, or $1.51 per share, last quarter. Again, investors should note that this 49% year-over-year increase in adjusted earnings easily outpaced the company's customer growth. Palo Alto is growing its business in a profitable manner despite the cutthroat competition in the cybersecurity industry. 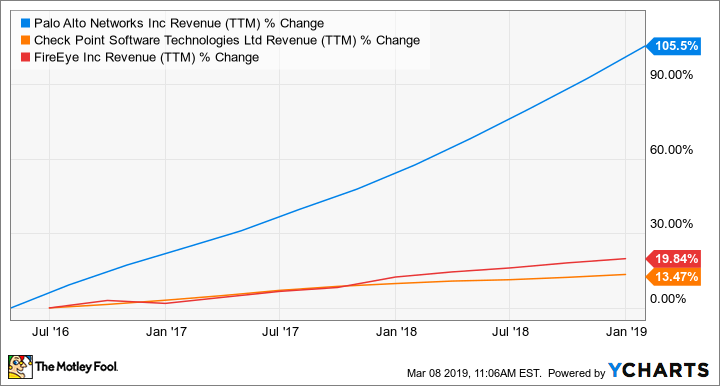 Moreover, the company's revenue growth is far greater than what some of its peers have been able to clock in recent years. Check out the latest earnings call transcript for Palo Alto Networks. PANW Revenue (TTM) data by YCharts. And a closer look at Palo Alto's modus operandi will make it clear why the company has been able to outpace the broader cybersecurity industry and its peers. What's working for Palo Alto? As mentioned earlier, Palo Alto's strategy of acquiring smaller peers has been crucial to its growth. A new acquisition doesn't just bring new cybersecurity capabilities to Palo Alto's plate, it also brings a new set of customers. So the company can cross-sell its existing solutions to those new customers, and at the same time offer the acquired company's new solutions to its existing clients. In this way, Palo Alto can boost its sales in a cost-efficient manner. Take note that the company's sales and marketing expenses fell to 45% of total revenue last quarter as compared with nearly 47.5% during the prior-year period. This allowed the company to post a small operating profit for the second quarter versus a loss in the year-ago period. So it is not surprising to see that Palo Alto will stick to its strategy of acquiring smaller companies and boosting its reach in the cybersecurity space. It recently spent $560 million on Demisto to integrate machine learning and artificial intelligence (AI) capabilities into its platform. That was a smart move given that demand for AI in cybersecurity is expected to grow at an annual rate of more than 30% through 2025. Palo Alto is likely to continue making new acquisitions, as CEO Nikesh Arora stated during the latest conference call that it continues to evaluate companies. Any acquisitions won't be surprising because Palo Alto is sitting on nearly $1.3 billion in net cash, which it can use to bolster its capabilities and attract more customers.